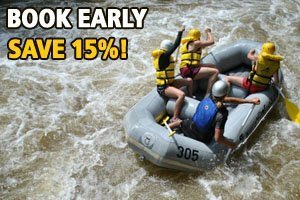 Top 5 Family-Friendly Tips and Tricks for Rafting in Ohiopyle! Here at Laurel Highlands River Tours and Outdoor Center, we know how time-consuming and, occasionally, stressful planning a family activity can be. So we thought, “How can we make it easier for you?” The answer: the Top 5 Family-Friendly Tips and Tricks. 1. Make sure you choose the appropriate section of river for your family. We are often asked, “How old do my kids need to be to go rafting?” The short answer to that is four years old. But, let’s break it down a little more. Our family-friendly tours take place mostly on the Middle and Lower sections of the Youghiogheny (Yough) River in Ohiopyle, PA. On the Middle Yough, you can bring children as young as four years old. On the Lower Yough, children 12 and older can participate. 2. Pick a tour option that best suits your family. Not all families are created equally. With many tour options, you should be able to find the perfect tour for your family. The Middle Yough is a calm and scenic river with several Class II rapids that have small hydraulics and waves. The Guided Escorted option i most popular for amilies with two or more adults and young children. But let’s say you are a single parent bringing young children. Navigating the river in your own raft may be challenging. So a Fully Guided tour may be the best for you. The Guided Duckie option is a great choice for families that have a mixture of young and older children, or young adults. It offers a bit more excitement for the older members of your family. And don’t forget that you can mix option types among your group! Let’s say mom and dad, and the little kids go Guide Escorted, while the teenagers go Guided Duckie. You will always stay together, and then you can switch out who paddles in the duckies along the way. The Lower Yough is a bit more advanced than the Middle. It’s Class III rapids are more frequent with bigger waves and more maneuvering. The Guide Escorted option is popular with families that have older children or young adults who have some experience whitewater rafting and feel comfortable navigating their own raft. The Fully Guided option is a great choice for families with children between 12 and 18 with no rafting experience. And if you are looking for a more personalized family experience with just your group the Premium Guided tour option is for you. Just like the Middle Yough, you can mix Guide Escorted or Fully Guided options within your group. So some of the more experienced and older family members could go Guide Escorted and younger family members could go Fully Guided. Your guides will help keep your group together throughout your tour. 3. Prepare appropriately for your adventure. Lunch is provided on all guided tours, but you should pay attention to the check-in time to figure out when lunch will be served. Lunch is generally served about two and half hours after your check-in time. Keep this in mind when at breakfast! You may want to eat later or have a bigger breakfast. Snacks are always great, too! Granola bars, fruit snacks, trail mix, and pretzels are all great choices. And be sure to bring drinks along. But keep in mind – glass is not permitted on the river. Water bottles, reusable or disposable, and sport drinks help keep you hydrated on your adventure. You can bring a small soft-side cooler, backpack, or dry bag to keep your goodies in. There are not pouches on the raft, nor is there ample area to tie things down. Sunscreen – A must on even cloudy days! Don’t forget lip balm. Waterproof Disposable Camera – You can bring a digital waterproof camera, but, please remember, there is always a possibility of losing it! Ponchos – Even if it’s not raining, ponchos can come in handy to keep the chill and splash off. Baseball Cap – Most caps fit well under the helmets required on all Lower Yough tours. Keep in mind, it will most likely get wet. Glasses Strap – If you plan on wearing glasses on the river, a strap to hold them on is HIGHLY recommended! Medications – If there are any medications that you may need while on the river, be sure to bring them along. You guides can store them in the First-Aid Kit. This includes inhalers and EpiPens! Foul Weather Gear (as needed) – Rain-jackets or rain-pants can be worn on the river to help keep you warm. Spray Jackets are available to rent at check-in. Cool Weather Gear (as needed) – Under Armour, fleece, wool and other synthetic clothing help keep you warm on the water. Avoid cotton since it robs your body of heat once it gets wet. Wetsuits are available to rent at check-in. We’ve got you covered! Most of the above mentioned items are available for purchase at the check-in area! Check out our Facebook page! You can browse through photo albums of the various sections of river we run. See what others are saying about us, the tour you chose, and your guides. Get on our website! Check out what Specials are currently available. Download liability release forms for ALL members of your party, especially any minors traveling without a parent or guardian. Read more about all the sections of river we run, the options offered, and other activities available. Stay connected to our blog for more of what’s happening! Surf our YouTube channel to see the experience! Have the whole family watch so everyone knows what to expect before you get here. 5. Get ready to have FUN! To avoid added stress or delays on the morning of your trip, make sure you have everything you need before leaving home. Did everybody eat breakfast? Do you have drinks and snacks for everyone? Did you remember all your extra stuff or are you planning on purchasing it when you check-in? Do you have all necessary medications? Have you packed everyone’s liability release forms? Do you know where you are going? Make sure you know the check-in location for your river tour. Turn-by-turn Directions and Google Maps are available on our website. We recommend allowing some extra time before your check-in time to find a good parking spot, use the restroom, and/or connect with members of your party that may be traveling separately. Keep in mind, cell phone service can be spotty. Be sure to talk to the check-in staff or your guides about any concerns you may have and all medical problems that may affect your rafting adventure. And don’t forget to check out your photos at the end of the day! Take home great reminders of your rafting experience. ← Explore Ohiopyle Zip-line Adventure Park and Ohiopyle Mining Company!